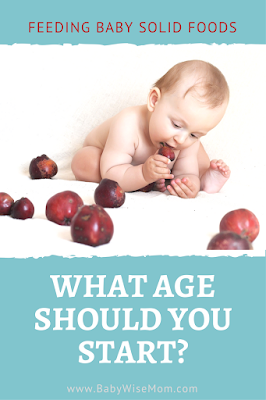 What Age Should You Start Feeding Solid Foods to Your Baby. How to tell when your baby is ready for solid foods. Reasons to wait to introduce solid foods. Like many things when it comes to parenting, the age of when to start solids can, not surprisingly, become a hot topic where feathers get ruffled and people get defensive right away. Ultimately, the exact age is up to you, your baby, your baby’s doctor. That is who should have an opinion on it. I personally started all of my children at four months. If your baby is ready and eager. My first was beyond ready (in his mind) at four months. When your child is so eager, it makes it much easier to get them doing it. The older a baby gets, the harder it is to get them to do new things. The thing I loved the most about starting solids at 4 months was that I could take things really slowly. At 6 months, your child NEEDS food other than milk. So there is a bit of a stress to get things going quickly. With my kids, I did rice cereal for a month before I moved on to start introducing veggies, then fruits. This way you can really be slow and watch carefully for any possible allergies or problems. You can also have the art of eating down by the time they are 6 months. Reflux. Solids are said to help reflux, and they dramatically helped Kailtyn. But I know of one baby who it didn’t help, so it is no guarantee. Number one is a history of food allergies in your family. It is just one more thing to do. Adding solids to a meal (even just a tablespoon of rice cereal) significantly lengthens mealtime until they get the hang of eating. So that can be inconvenient. Of course, this in inevitable. You will start solids some day. You have to get the meals in when you are vacationing or out and about. It is no longer just a matter of finding somewhere to nurse or mixing up a bottle. They need only milk until they are 6 months. I have read that you risk giving inadequate nutrition if you do solids and the baby doesn’t get the milk they need. BUT, I think if you follow the guidelines in BW 2 for starting solids, you really don’t run that risk. Physically are the “can sit supported” and “can swallow” food things you can read about anywhere that has info on if a baby is ready for solids. Mentally–they want it. They watch you eat. It looks like they are coveting your food. They smack their lips when you eat. They open wide when you feed them…they are mentally in the game, so to speak. In the future, here are my plans as far as solids go. Any child who is aching to start like Brayden was will start at 4 months. Any child with reflux will start at 4 months. Otherwise, I think I will start at 5 months. I like to start in advance of the physical need for more than breast milk because I want to be able to take things slowly and not worry about introducing foods fast enough. I like to take changes slowly with my kids. The reason I would wait until 5 months is it just takes longer to feed them solids–so it is totally a convenience thing. Do your research. Talk to your doctor. Analyze your baby. Trust your gut. Solids: How Much Food Will Baby Eat at Each Meal? Next Post Solids: How to Start? I just thought I would add that I have a 6 month old GERD baby with very bad reflux – solids did not help her though my pediatrician said they might (thanks for adding that in this post). She’s on Prevacid, which has been wonderful. Just a bit of advice for other parents of GERD babies, if your baby goes through a growth spurt be sure to watch for signs that the meds aren’t working as well as they had been before. I was problem solving for napping problems and fussiness and didn’t realize that maybe she had outgrown her dosage of medication after 2+ months! She’d been doing so well on Prevacid that I had forgotten about including reflux into my problem solving list so I didn’t catch it right away. Valerie, thanks for posting some info on reflux – I was so frustrated as a Babywise mom because I thought my baby was just fussy/difficult and really she was in pain. I really felt alone and most books I consulted didn’t pinpoint a specific list of things to watch out for if you may have a GERD baby because after all, some babies just spit up a lot, are tempermental, etc. It complicated things that my baby wanted to nurse all the time (ped said it was because nursing provided temporary relief from reflux) and was gaining weight. Anyway, thank you for touching on reflux in some of your posts! It’s nice to have a happy, well-rested baby after all that drama so early on and it’s so nice to hear that my experiences aren’t all that unusual. Thank you! Thanks for your additional thoughts on reflux. It can be so different for everyone so it is nice to get several perspectives on it. Thanks for the site. At first I was very frustrated with Babywise but now, I love it! My LO will be five months old in a couple of days and we plan on starting solids…rice cereal. My doctor said only 1T at first. I figured I would do this at her 1:00 feeding. As of now, she nurses 5 times a day starting at 6:30, 10:00, 1:00, 4:00 and 7:00. How do I know when to increase the amount of cereal I give her? And do I increase the amount I give her at 1:00 or do I just it to another feeding? Do I feed cereal and then nurse? Too many questions. I get nervous when I start something different with her. Just when we get comfortable with one schedule it is time to change. Jenny, I am pretty sure I feed cereal at just one feeding a day for a week before adding it to another meal. You can look through all of the solids posts for confirmation on that. It will be pretty obvious when to increase more than one tablespoon. At first she most likely won’t eat it all. As she eats it all, you can mix two Tablespoons and see how much she eats.At first, I nurse one side, solids, nurse the other side. Once they are good at eating, I nurse both sides before feeding solids.The schedule does change quite often 🙂 It really isn’t until they get down to one nap that things seem to stay the same for a while. So my baby is going to be 4 months next week and I feel like my milk is really low and have been wondering if I should add some solids into the day to make sure he is getting nice and full. I have been doing babywise since he was 3 weeks old and I’ve been successful, but he is still waking up around 3-4 am to eat. I think he is waking because he eats so little during the day. When I pump and give him a bottle he will take at the most 3 1/2 oz. But sometimes I can only pump 1.5 to 2 oz so I am guessing he is getting that amount at a feeding which seems very low. After nursing he seems satisfied but since my mind is constantly on the amount I am pumping out I feel like my baby isn’t getting enough. He is gaining weight just fine and has wet diapers. I just don’t know how much breastmilk he would or should be intacting for his age. And if it’s not enough if solids would help. BTW I have been taking Fenugreek, drinking a ton of water, and drinking mothers milk to try to produce more milk. Not really helping. What are your thoughts? I appreciate your website. thanks so much! i appreciate your response and encouragement! Hi. Our LO started on solids very early around 4 months. She did ok but was never an extremely big eater. She has never liked fruits very much, some veggies but usually loved her oatmeal at breakfast. For the past month or possibly 2 she has been a terrible eater. Has not wanted to eat anything really except her formula. I excused it as a phase, teething or something. However, it has gone on a while now. I have tried changing the routine, food before bottle, but she holds out for her bottle. Bottle before food and she won't eat and just spits! (She does this anytime she doesn't want to eat.) I even tried food later into her WT hoping she would be hungrier then but no luck there either. If we are lucky she will take a teaspoon or tablespoon at best. She used to eat half the jar. She is drinking somewhere between 24 and 40 oz a day(4 or 5 bottles of 6-8oz each) depending on her hunger. Should I reduce the formula? I always have assumed she needed all those vitamins and nutrients from her bottles. She has been waking early around 5:30am(usual wt is 7am) I think it is from hunger as I fed her this am at 6:30 and she was extremely tired and fell back to asleep. This never happens and try not to let it as throws the whole schedule off. Not to mention encourages eating to fall asleep. She has been exhausted from early wakings and traveling this week. (Could be EW wanting to practice her new skill of crawling she just mastered?) She also seems to be wanting to be independent as she will always eats puffs and things SHE can pick up and put in her mouth. This is hard as she just has 2 little teeth. I don't want to just feed her this as she will become a snacker and not an eater. Any advice helpful, I am sick of throwing away expensive baby food!!! Leo:Unfinished, it si hard to say without knowing her age. I don't know how many ounces babies need until 12 months since I breastfeed until then. I think that would be a question for your pedi. If she is old enough, you can allow her to self-feed. Some babies just don't like mushy baby food. Kaitlyn was that way. If she is over 7 months, work on finger foods. If you live in the northern hemisphere, this is a great time of year for fruits and veggies. You could also try pureeing your own food. You could make it less runny and she might like it better. I have had many friends and family tell me they gave their little ones cereal at around 2 months to help them sleep through the night. I have a 2 month old and will be going back to work fulltime in 3 weeks so I do need her to start sleeping through the night soon! 🙂 She is currently going to bed at 8:30pm and waking at 3am to eat. I've tried dreamfeeding around 10:30 but this only seems to make her wake earlier or still at 3am for some reason. Her first feeding is at 6am, so I just wondered if I gave her a bit of cereal at her 8pm feeding if this would possibly help her sleep the extra three hours and if that would be ok? Her schedule is 6am/9am/11:30am/2pm/5pm/8pm. ebhopkins, I wouldn't do it, but if it is something you want to try, I would consult with your pedi to see what he/she thinks and recommends. Hello! I had previously posted about my 4.5 month baby only gaining a pound between her 2 and 4 month check up and what I should do. She had been on a 3 hr schedule and I bumped her back to a 2.5 and added a dreamfeed at night. However, her change in schedule hasn't seemed to be the best thing for her. It's been about 2 weeks since the change and things have seemed to get more off as time goes on. Sometimes she's waking earlier in the morning now and her naps are consistently poor. I feel like there are so many variables now that I can't rightly assess what she needs and what's the cause of her poor sleeping. When reading this post it made me wonder whether or not we should reconsider starting her on solids already–just some rice cereal. She's just over 20 weeks. I know that her provider wants her to wait =, and originally I was thinking we would until about 6 months, but I'm really feeling that she needs to be back on a 3 maybe even 3.5 hr schedule. She was sleeping 12 hours through the night before just fine and wasn't showing constant signs of needing more food. She just hadn't gained as much as her provider thought she should have. I know she's definitely gained more since she's been getting the 7 feedings vs. 5 over these past two weeks. But I'd like to wean back again. And from what I've read, others have experienced having babies that don't gain much from one check up to the next or are just super "small" in general and are totally healthy and fine. She had no other signs of being unhealthy. She's just always been skinny. Anyways, was just looking for some more feedback….